Luckyfinds: Thermomix is the all-in-one kitchen machine you'll ever need! Thermomix is the all-in-one kitchen machine you'll ever need! Thermomix is regarded as German precision at its best! Developed by over 120 engineers and technical experts, this product of Vorwerk was designed initially to make baby foods in 1960’s. Thermomix products have 21 patents for its technological design and innovation, winning the prestigious “red dot” award alongside with companies such as Apple Inc., Mercedes-Benz, Bose and BMW to name a few. Thermomix had gone along way since the time it was first launched in Germany as a food processor. After many years of innovation, it combines the functions of 10 appliances in one unit! Thermomix can chop, beat, mix, whip, grind, knead, mince, grate, juice, blend, heat, stir, steam and even weigh food. Thermomix is the the only appliances you will need in the kitchen! It saves you time, money and space by having one kitchen appliance to do all your cooking and it makes preparing good-tasting food fun and healthy! It can be your blender, food processor, cake mixer, juicer, bread maker, ice cream/yoghurt/sorbet maker, mincer, steamer, rice cooker, coffee grinder, food miller, purees, whisks, emulsifies, scale and much more. Thermomix makes one minute fruit sorbets, real ice creams or café latte! You can use the fruits in season and make fresh fruit juices without the mess or create your own healthy sorbet masterpiece. Thermomix can mill rice into rice flour,mill fresh coffee, grate chocolate, pulverize sugar into icing sugar with ease. It can help you prepare, cook and puree soups all in one bowl. Create fantastic sauces right at your fingertips with Thermomix! Thermomix makes possible healthy cooking to retain the food’s natural color and nutrients via Thermomix Varoma's gentle steaming. Included with the unit is a mixing bowl and lid, simmering basket, stirring attachment, measuring cup, spatula and Varoma (steaming bowl), as well as a recipe book. The heating element is incorporated into the bottom of the mixing bowl rather than inside the main unit. Its lid has provisions for spillages should a mixture boil over while cooking. 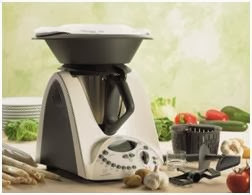 Thermomix is exclusively distributed by Modern Innovations Enterprise in the Philippines. 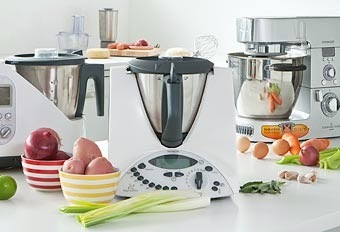 Visit www.thermomixphils.com or contact infor@thermomixphils.com for more information about the product.